I've now talked to a fair number of controllers whose fathers or sons were also controllers. Their stories never fail to interest me for inevitably they are stories of passion--passion in their relationships (sometimes marked by conflict), in their attachment to the work they did as controllers, and in their feelings about what happened to them and their families. (Pictured to the left is a PATCO striker and son, 1981.) This week I've heard from another strike veteran, Pat Garrett, who wrote to tell me his story about being fired and about his dad, who was also a controller, and who, as Pat explains, embodied the passion to which I refer. I post Pat's letter now in the spirit of Father's Day. I just read Collision Course. Thank you, for a well written and researched book. It provided new details of the union and the strike and brought back a flood of memories, emotions and some responses. 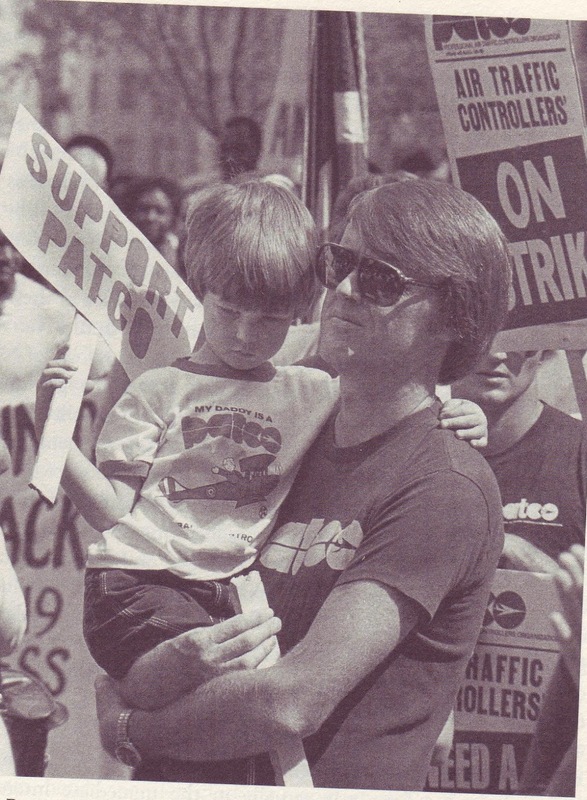 I am a fired PATCO member from Santa Barbara, CA and the son of an air traffic controller of 25 years. He retired just before the strike. with the military-like attitude of the FAA. It turned out true. Your book accurately portrayed the details. 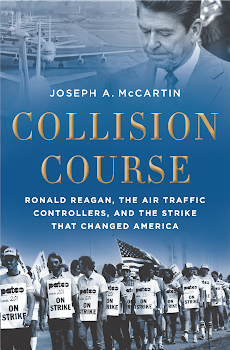 Several comments regarding the union, the FAA, President Reagan and myself are in order. The book's introduction was difficult for me to read. It bothered me that the leadership knew it was a lost cause before the 48 hour deadline and didn't act accordingly. You addressed this later in the book saying the union had decided their course of action years in advance and also realized that many would not accept the idea of returning to work as a defeated group. I am not sure that was fair to those who wanted to retain their jobs. They believed the union leaders story that we would force the FAA to negotiate. Drew Lewis' and the FAA's surprise that more controllers didn't return before the 48 hour deadline is telling. For years I've told many that a big mistake by the Reagan Administration was not to extend the deadline. I believe the trickle of controllers returning would have become a flood. For example, ninety percent of about 30 controllers from Santa Barbara Tower went on strike. Three returned within the 48 hour deadline and several tried just after it. More were wavering. With an extended deadline more may have returned. Nation wide a similar pattern may have resulted. That meant a larger contingent of journeymen controllers, fewer new trainees and less money spent. President Reagan and the US put their full force into destroying PATCO. Their deal with the ATA provided one example. I feel you missed one aspect regarding this. PATCO had a several million dollar strike fund. Each local had a share of this. Before the strike I suggested that we withdraw that money in cash and cautioned that the government would attach it. My fellow PATCO members responded that the government could not do this as it was not legal. The strike started. The government froze the money immediately. Later they gave it to the ATA. The lost money impacted PATCO operations on all levels. President Reagan arrived at his ranch near Santa Barbara shortly after the strike began. Our local planned to picket the entry gate to the ranch. Moments before we left from our safe house a PATCO representative called instructing us not to picket. We did not. Later when visiting here Domenic Torchia stated that a Presidential aide lied that PATCO would benefit if we did not picket there. This allowed President Reagan to vacation without a visual reminder of us. I've survived the 31 years since the strike. I've developed a landscape business with another former controller in Santa Barbara. It's provided plenty of hard work and we've done well. Periodically, I interact with other fired controllers including a couple who returned after Clinton lifted the ban. I still bump into our former Chief from Santa Barbara Tower. My Dad passed away in 1993. Someone mentioned the name of one of his former supervisors as a pall bearer. We decided against it. We feared he would punch him in the face from his casket. Sure many still feel the same way about the FAA. If it matters, my Dad's name was Edgar Garrett. He spent much of his career at Sacramento Rapcon. Here's another funny controller story and I'm sure you've heard maybe too many. In the mid 60's Ed rode a motorcycle to work. His chief told him that was not becoming of a controller. He bought a larger one and rode it to work. Eventually others rode bikes too.